Soyabella SB 132 Soymilk Maker is a must-have for your kitchen! Serve yourself healthier and delicious drinks in your breakfast with the help of the Soyabella Soymilk Maker. 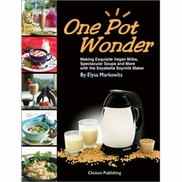 With the tofu kit supplied with the space saving soymilk maker, you can make an array of delectable drinks, such as almond milk, beans or rice paste, porridge, and soups. If you are fond of milk shakes and smoothies and love to try out different drinks, the Soyabella SB 132 is a valuable accessory for you. The elegant and robust Soyabella soymilk maker comes with a stainless steel lid and a tofu kit that will take your cooking skills one notch higher. You can make variety of milk shakes with added richness of dry fruits or make necessary pastes for meals. Unlike other conventional soymilk makers, the Soyabella SB 132 is equipped with various avant-garde features to make your cooking more effortless and time saving. It is light in weight, easy to carry, and demands least maintenance. The built-in heating chamber of this soymilk maker allows you to clean it with minimum efforts. The handle of the jar is made from heat-resistant material that prevents your hand from burns or bruises while you pour the preparation into a vessel. The Soyabella Soymilk Maker has been supplied with a measuring cup, through which you can keep a check on the amount of dry fruits, fresh vegies, milk and water required for the recipe. The multi-processor of this one-touch-operation appliance allows you to set multiple programs and prepare mouth-watering desserts for your guests in no time. The Soyabella SB 132 is equipped with a unique safety mechanism that does not let it start until or unless the lid is locked properly. The LED indicator on its foot periphery and the sound notifications of this maker allow you to make drinks in a more controlled manner. The smart on-board design of this maker keeps the internal elements cool and eliminates the chances of over-heating. 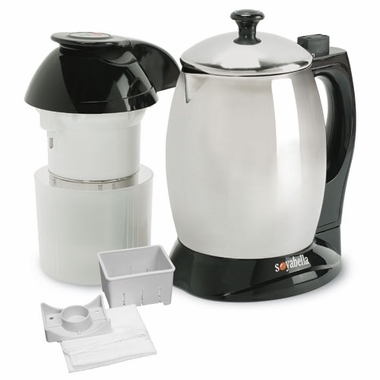 The contemporary design and classy look of this Soyabella Soymilk Maker will perfectly complement your kitchen. You can easily fit in any space deficit shelf of your kitchen.